Jennifer Niven is such a stunning writer, any of her books and unique voice will stay with you for a long time. 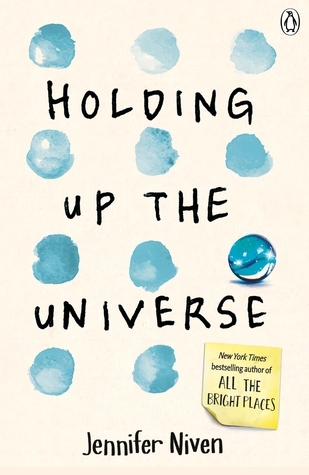 One of my favourite things about Holding up the Universe were the descriptions- they were just so vivid and perfect. The book centres around two teenagers, Jack and Libby. Jack is amazing at building complicated mechanical things, but can't recognize faces: even his own brothers and parents. No one knows this about him, as he hides his prosopagnosia by recording tiny features of someone, so he still knows who they are. He just wants to play it cool, and not get too close to anyone. Libby used to be called 'America Fattest Teen,' but people have looked past her without realising who she is on the inside. After trying to deal with the death of her mother, picking up the pieces for both her and her father, she feels she is ready for the adventures that High School has to offer. But when the protagonists get wrapped up in a horrible game that makes them end up in group counseling together, there could be unexpected consequences both wouldn't think would happen. I could connect to both of the characters so much- I especially loved Jack and Dusty. Even minor characters had their own little stories branching off, which made me want to read a whole book about them all: that is such a talent of Niven. Her writing style just takes you straight into the novel, drawing you in so much that you physically can't let go and put the book down. 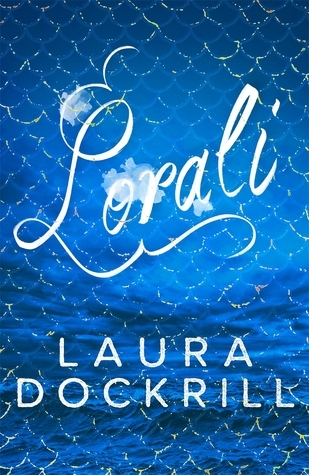 The chapters were a perfect length for me, I adored how the point of view constantly flickered between both Jack and Libby, which made me connect with them on a personal level. The plot was also a fantastic pace, holding my full attention and interest for every single page. 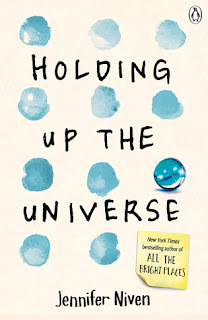 A faultless 5/5: Holding Up the Universe was everything crammed in a book that I love, covering so many different issues that every teenager can relate to, showing you shouldn't hide away from the world and follow the crowd.